Rocky Mountain Laboratory researchers. 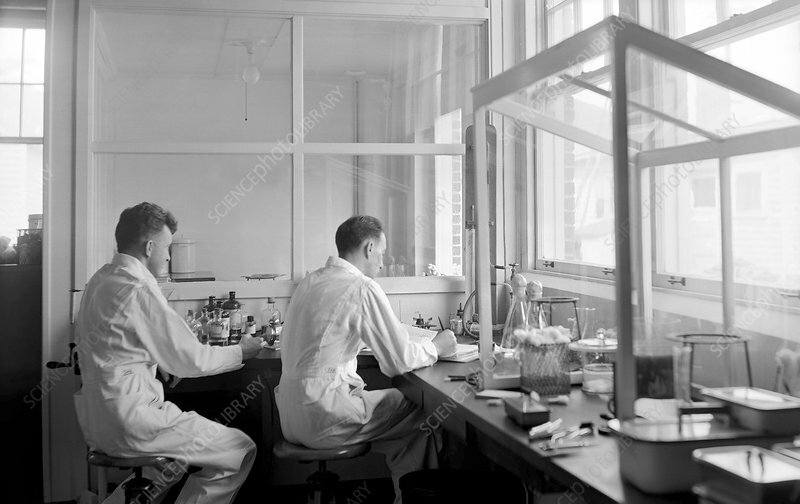 US scientists Lyndahl Gene Hughes (1914-1980) and (Emlen) John Bell (1911-1990) at work in the laboratory of US bacteriologist Herald Cox (1907-1986). Cox and his colleagues worked on diseases such as Rocky Mountain spotted fever and other tick-borne diseases caused by pathogens such as bacteria. Photographed in April 1938 at the Rocky Mountain Laboratory, Hamilton, Montana, USA.